Find out what our experts have to say about Suzuki Gixxer! The Gixxer is the most popular motorcycle from Suzuki in India. Good looks, practicaility, superb handling and refined engine immediately made this bike talk of the town. The bike is powered with a 154.9cc engine and is available in two models, naked one as Gixxer and a faired one as Gixxer SF. The motorcycle was updated with a rear disc brake for both the models and a FI for the SF. Bith the models carry limited edition and special edition variants along with different paint schemes and are now updated with the BS-IV engine, AHO (Automatic Headlamps On) feature and new colours with liveries. 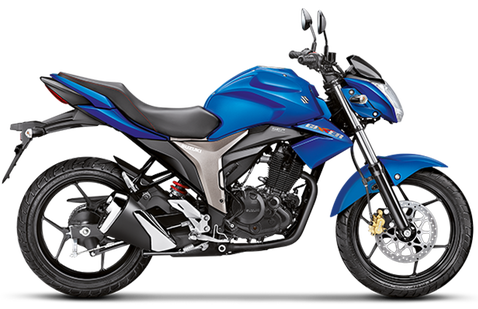 The least priced variant is Suzuki Gixxer STD priced at Rs. 92,994 and the most priced variant is Suzuki Gixxer ABS priced at Rs. 1,07,100. Choose the Suzuki Gixxer which fits the bill of you. Suzuki had no mentionable bike model before they launched the Gixxer. By introducing Gixxer, Suzuki changed the game of the streetfighter bikes due to its competitive pricing. Now they have topped it by launching the new Suzuki Gixxer 2018 with single channel Anti-lock Braking System (ABS) variant. New graphic design make the bike look more sporty and stylish. But it still carries the same old amazing characteristics of performance, stability, refinement, comfort and economy. The engine, the power, the torque and almost everything is pretty much the same. Suzuki Gixxer competes against the likes of Yamaha FZ, TVS Apache RTR 160, Yamaha Fazer, Honda CB Hornet 160R and the Bajaj Pulsar 150. Colours available on this bike are Metallic Triton Blue, Glass Sparkle Black and a new colour, Candy Sonoma Red/Metallic Sonic Silver which looks very stylish. The Suzuki Gixxer 2018 retails for a Drum Brake Variant at Rs.77,015. For the the Rear Disc Brake Variant it costs Rs.80,929 and for the Rear Disc Brake With ABS Variant it costs Rs.87,250 (All prices Ex-showroom, Delhi). Suzuki Gixxer is designed to look sporty but also comfortable enough for you to ride it daily for work or errands. It now sports a new Candy Sonoma Red/Metallic Sonic Silver colour scheme with new and stylish graphics. The basic silhouette still remains the same but subtle changes are there. It now gets a huge powerful headlight flanked by two turn indicators and a clear LED tail light. Dual type chrome exhaust now improves the efficiency and is impressive in appearance too. The multi-spoke alloy wheels covered with fat radial tubeless tyres really complements the overall design. The seat is very comfortable for both the rider and the pillion. The major USP of this bike is the all digital instrument console which is best in class. This digital instrument console offers all the information like gear position indicator, RPM Indicator, LCD trip meter and programmable gear shift indicator among others. You also get a new ignition key that gives an indication of the flagship model and a proud sense of ownership. Suzuki Gixxer being a sporty looking bike is also perfect and well balanced, fuel efficiency wise. Though its not available in the Fuel Injected (FI) version like in the Suzuki Gixxer SF 2018 model, the Carbureted engine still packs a punch. Suzuki Gixxer 2018 features 154.9 cc, SOHC, 2 Valve, 4-Stroke, 1-Cylinder, Air-cooled engine. Power output delivered by the engine is 14.8PS at 8000 rpm and a peak torque of 14Nm at 6000 rpm. As the engineers have now worked on the engine, it is now smooth, refined and void of any vibrations. Further making the overall riding experience better is the 5-speed gearbox. If ridden decently, you can expect a fuel consumption average of 45kmpl. With a capacity of 12 litres, it has got a huge tank that will help you go miles without refueling. Riding the Suzuki Gixxer is now a much smoother affair. Now the clutch is very light and the gear shifts are smooth giving the rider a fatigue free riding experience. The new chunky 40mm telescopic suspension at the front increases the rigidity around the front section and reduces the weight thereby contributing to the sporty styling and riding performance. At the rear, the swing arm with a 7 step adjustable monoshock suspension aids stability & flexibility for various riders and riding conditions. There are no vibrations even at high speeds thanks to the ultralight and robust engine. Also, the wide 100/80 17-inch tubeless tyre in the front and the rear 140/60R 17-inch radial tubeless tyre provide superior road grip. The bike seems very planted and stable during high speeds thanks to its weight of 136 kgs. With this kind of stability, you can easily go on long highway rides without any stress or fatigue. Due to the mandatory regulations set by BSIV norms, the Suzuki Gixxer SF comes with Always Headlight On (AHO) feature. The visibility of the bike increases with the AHO feature in any light conditions. The Gixxer now sports Anti-lock Braking System (ABS) variant that comes fitted with a front wheel speed sensor to detect wheel speed for better stability and controlled braking force. With the ABS installed on your bike, you can be rest assured to have a safe and comfortable ride.